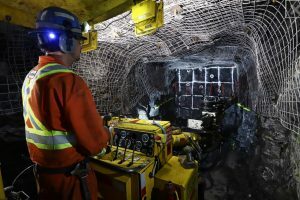 ONTARIO – The management at Vancouver-based Pure Gold must be pleased with the results of test mining at the Madsen gold mine 16 km west of Red Lake. The test is complete having mucked 7,096 tonnes of mineralization from three separate stoping areas, and the results exceeded expectations by almost any criteria. Using a 4.0 g/t gold cut-off, the bulk sample had 46% more tonnes, an 8% higher gold grade, and an estimated 56% more ounces than predicted from the resource model. The overall mining width was 5.3 metres, 53% wider than predicted. The average grade of the material was 10.2 g/t gold. Hole PGB-015: 15.2 g/t gold over 2.9 metres. The Madsen mine operated between 1938 and 1976, during which time the mine produced 2.5 million oz. of gold from an average grade of 9.9 g/t. The property was re-explored by Placer Dome under option from Claude Resources from 2001 to 2006. Claude dewatered the mine, conducted surface and underground drilling, and prepared a resource estimate between 2006 and 2013. Pure Gold purchased the Madsen property in 2014, advancing the project to the current development stage. For a complete list of 2018 drill results to date, click here.